“Tryggare kan ingen vara,” the classic Swedish psalm called “Children of the Heavenly Father” in English, was sung in both languages earlier this week at Mount Olivet Lutheran Church in Minneapolis, Minnesota, as the life of former Democratic Governor Wendell Anderson was celebrated. “Wendy,” as he was called, died on July 17, 83 years old. He was Sweden’s best friend in Minnesota — maybe in all of America. Hundreds had gathered in the church, founded by Swedish immigrants, to a service dedicated to all things Swedish. Political Minnesota, both former and present leaders, Democrats as well as Republicans, filled the front pews – a former Democratic U.S. Vice President, two former Republican governors, a U.S. Senator, legislators, members of Congress, and many, many political friends. Wendell Anderson, Minnesota’s governor from 1971 to 1977, loved Sweden. He once wrote, “I am a Swede who happens now to live in America.” Born into a working class family in St Paul, Anderson became a star hockey player, first at the University of Minnesota and then as a member of the U.S. national team that won the silver medal at the 1956 Winter Olympics. All his grandparents were Swedish Americans; three of them were born in Sweden. He had been to Sweden 40 times and, he once told me, was even thinking about getting a “stuga” so he could spend his summers there. 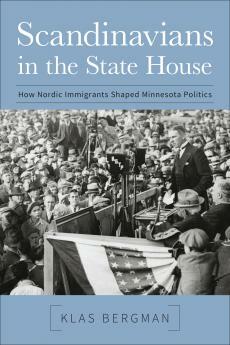 After law school, only 37 years old, he became the state’s youngest governor ever, winning 13 of 14 Swedish counties and nine of eleven Norwegian, three of four Finnish, and both of the most Danish counties in Minnesota. In 1974, riding high, he was reelected in a landslide, capturing all of Minnesota’s 87 counties. By then, the young governor had landed in the national spotlight as he followed up on his campaign promise through the Omnibus Tax Bill that raised 588 million dollars in new taxes for increased state support for public education. The bill was a fundamental reform of school finance, equalizing school funding between rich and poor districts, and became known as the “Minnesota Miracle” – the high tide of liberalism in Minnesota – despite both the State Senate and House being controlled by the Republicans. 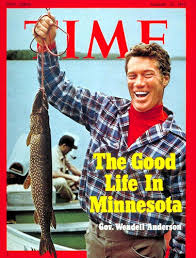 On August 13, 1973, Wendell Anderson landed on the cover of Time Magazine with the headline, “The Good Life in Minnesota,” and the state was described as “the state that works.” But his decision in late 1976 to resign and assume the seat in the U.S. Senate that Walter Mondale vacated upon his election as U.S. Vice President proved politically fatal. He lost the election to a full Senate term in 1978 to a Republican. A Republican also captured the second Senate seat and his successor as governor, Lieutenant Governor Rudy Perpich, lost his bid for a full term to a third Republican. The decade that had started with the “Minnesota Miracle” ended with the “Minnesota Massacre.” Wendell Anderson’s political career was over. He was never again elected to political office. He practiced law and served as a regent of the University of Minnesota. In 1975, he was selected Swedish American of the Year and he also served as Sweden’s honorary consul in Minnesota. A Swedish flag, blue and yellow napkins, and coffee and cookies, greeted the attendants in the church basement after the memorial service. The prominent mingled with the less prominent in typical low-key Minnesota fashion before they all went their separate ways. Former Vice President Walter Mondale and his old friend and law firm colleague, former Minnesota Attorney General, Warren Spannaus, lingered, and as the two political war horses walked out of the church by themselves in the afternoon heat, Mondale took off his jacket and swung it over one shoulder. They crossed the busy street with the help of two traffic cops and walked slowly up the block as cars buzzed by. At the corner, a woman, waiting for a bus, greeted the two before they turned into a side street where they had parked, apparently unable to find parking in the church parking lot. They climbed in and Spannaus drove off, with the former Vice President of the United States as passenger in the front seat. After Charleston, South Carolina, there is a new, vigorous debate about the Civil War, the Confederacy, race relations, slavery, and, about truth in history. It is all very healthy, and all long overdue. In today’s Washington Post, professor James W. Loewen has some very interesting thoughts about this, about how the Confederacy lost the war but won the history. It is time, he writes, to “de-confederatize” the United States and set history right. The war was about slavery, nothing else. “Removing slavery from its central role in prompting the Civil War marginalizes African Americans and makes us all stupid,” Loewen writes. Today, the South has changed, of course, and the gangrene has healed. But I remember that even in the 1960’s, the South was a strange and frightening part of America, and not just for blacks. If you were a young, white student and drove a car with license plates from a northern state — be careful! Anything could happen. My picture of the South, the eleven Southern States that fought for slavery in the great Civil War from 1861 to 1865, has long been influenced by the 60’s, when so much injustice and violence and death was part of everyday life in that part of America. Still, today, I cannot completely get away from this picture when I travel through the South, because I am constantly reminded of the past. The South lost the Civil War and as a result, the slaves were freed but what followed were one hundred years of institutionalized discrimination and oppression. Everywhere, monuments remind the visitor of the past, and the scenes of the major battles are holy ground. But they are all monuments to a lost cause. The American Civil War between 1861 and 1865 was a war with many names, depending on whether one was for the Union or sympathized with the eleven States in the South, known as the Confederacy. Names like the War Between the States, the War against Northern Aggression, the Second American Revolution, the Lost Cause, the War of the Rebellion, the Brothers’ War. But whatever the name, it was a war for the preservation of slavery in the South, and it was bloody. During nearly four years of fighting, from Fort Sumter in South Carolina to Appomattox, Virginia, over three million soldiers fought and 620,000 of them were killed. Not far from my home in Maryland, at Antietam, one of the bloodiest battles of them all took place — 23,000 soldiers on both sides died. The free black population in the North consisted of only one percent of the total population, but in the final stages of the war 180,000 black soldiers fought for the Union, or ten percent of its forces. Their victory was the slaves’ victory, and America’s victory, even if the war cost President Abraham Lincoln his life and even if the Blacks in the South had to wait another 100 years for their true emancipation.